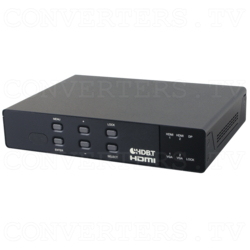 This HDMI/DisplayPort/VGA to HDMI Scaler with HDBaseT Output is designed to switch and scale up to 5 AV inputs to simultaneous HDMI and HDBaseT outputs at resolutions up to 1080p & WUXGA. Additionally, it offers 3 analog Line level inputs, a switchable Microphone input and a Line level output. The microphone input features a 48V 'Phantom' power mode for use with professional microphones. The audio DSP engine offers auto-mixing and auto-gain control to mix or reduce the background audio in order to enhance the main audio source. 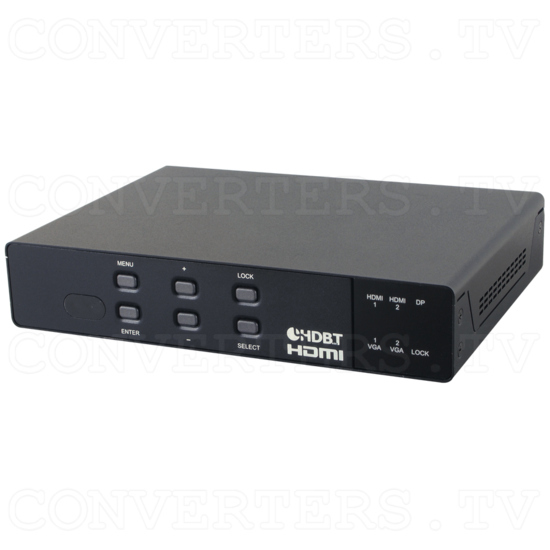 The HDMI/DisplayPort/VGA to HDMI Scaler with HDBaseT Output can be easily configured and controlled via WebGUI, IR remote control or RS-232. 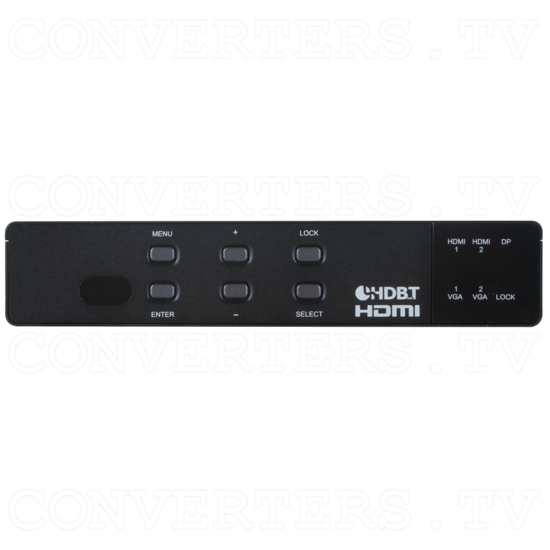 Use ID#15126 as the compatible receiver: https://www.converters.tv/products/hdtv_to_hdtv/15126.html This device is an ideal solution for presentation facilities at a classroom and/or conference room. Additionally, it offers 3 analog Line level inputs, a switchable Microphone input and a Line level output. The microphone input features a 48V 'Phantom' power mode for use with professional microphones. The audio DSP engine offers auto-mixing and auto-gain control to mix or reduce the background audio in order to enhance the main audio source. 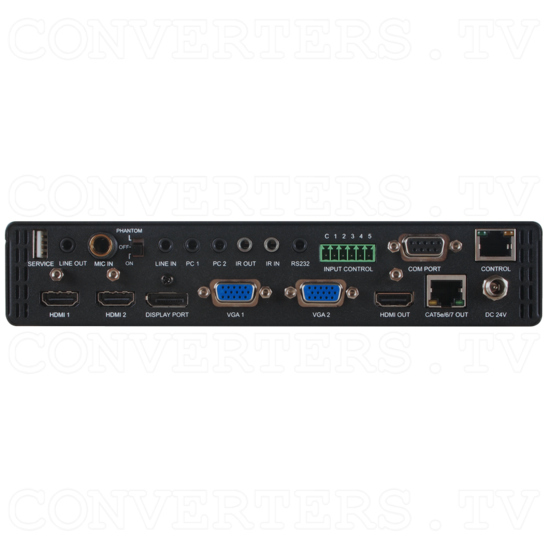 The HDMI/DisplayPort/VGA to HDMI Scaler with HDBaseT Output can be easily configured and controlled via WebGUI, IR remote control or RS-232. This device is an ideal solution for presentation facilities at a classroom and/or conference room.